Great Yurts to live or play, party or relax Great prices, Great design It's easy to set up. Easy to relocate it. Do you want to live in a yurt ? 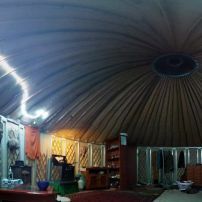 We got beautiful yurts for sale.Best prices in Australia.Come and look at them your self. Send sms or use whatsapp to call me. No reception in my yurt. Only internet access. We can arrange delivery anywhere in Australia. Must have access for delivery truck. commented on "5 years old yurt with platform successfully moved to new place"
commented on "Moving my 6 years old 6.3 diameter yurt with a platform of same age. 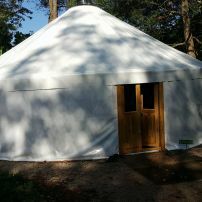 Platform finished yesterday and today we begun to erect the yurt." Moving my 6 years old 6.3 diameter yurt with a platform of same age. Platform finished yesterday and today we begun to erect the yurt. commented on "building a yurt platform with Craig Launer and Sachi Nomura at our new place in Goonegerry"
commented on "Do u know that payment for the yurts, can be done by Bitcoin, Etherium or Litcoin? If u want to know a bit more about cryptocurency, read this: https://www.investinblockchain.com/what-is-bitcoin/)"
commented on "Seems that there is a problem with our company email at domain @ozyurts.com.au. Please use alternative email byronyurt@gmail.com instead or messenger on this page." Seems that there is a problem with our company email at domain @ozyurts.com.au. Please use alternative email byronyurt@gmail.com instead or messenger on this page.